The best global estimate we have suggests that in 2016 around 40.3 million people were victims of modern slavery or forced labour. There is no particular reason to believe that this number is significantly higher—or lower—today. States committed in Target 8.7 of the Sustainable Development Goals to take effective measures to eradicate forced labour, modern slavery and human trafficking by 2030. Taking that seriously would mean that we would need to reduce the number of victims by around 8,994 people per day, in order to be close to zero by 31 December 2030. 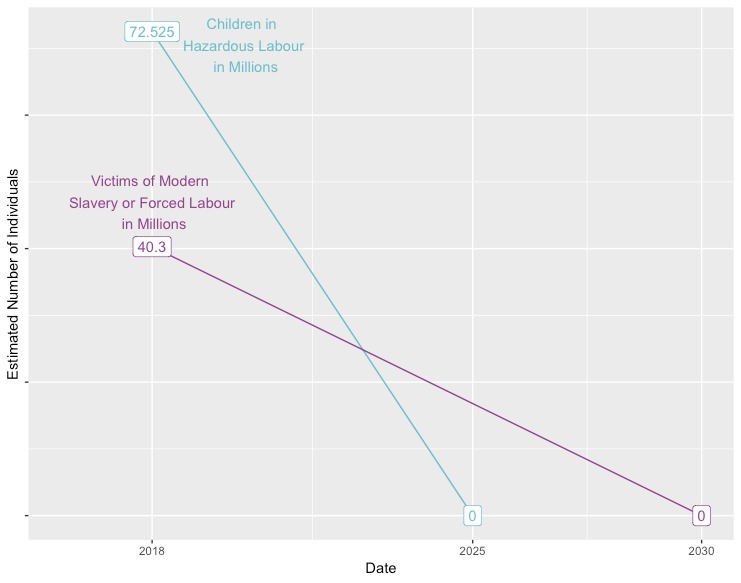 The numbers for the worst forms of child labour are even more stark, especially as the deadline for eradication set by Target 8.7 in that case is 2025, not 2030. With a best estimate of 72.525 million children in that category, achieving Target 8.7 requires removing around 27,306 children from the worst forms of child labour per day. These two numbers—8,994 people per day, and 27,306 children per day—are the starting point to determine the rate of change—or ‘delta’ (∆) as it is known in scientific circles—needed to meet Target 8.7 of the Sustainable Development Goals. How close are we to achieving Target 8.7? The short answer is: we do not know. Not in any scientific, systematic way. We do not know how many people are being removed from the forms of exploitation addressed by Target 8.7. We do not know exactly what makes people vulnerable to those forms of exploitation, which makes it hard to prevent them. We do not know which measures are “effective measures” and which are wasted effort. But we are learning. There is a rapidly growing marketplace of ideas about what works in the fight against forced labour, modern slavery human trafficking and child labour, and a fast-moving body of scholarship and science around these issues. This rapid growth poses its own challenges for everyone involved—especially for policy actors. We are all short on the time needed to find, consume and digest this material. Often, it is highly technical, and hard to understand. And without specialist scientific expertise, it may be difficult for policy actors to understand if they are pursuing the wrong metrics or relying on the wrong models. How can policy actors—and everyone else interested—find their way through all the noise, to the reliable signals about “what works” that may be emerging from the data and evidence? Delta 8.7 is helping solve this problem. Working with dozens of partners, the Centre for Policy Research within United Nations University has established Delta 8.7 as a knowledge platform for Alliance 8.7 – the multistakeholder coalition working to achieve Target 8.7, led by the ILO. We hope that Delta 8.7 will prove a useful guide to help policy actors understand the “effective measures” required to achieve Target 8.7. Fostering scientific community—and helping policy actors find and absorb scientific insights—is central to our approach. We don’t aim to pick winners. Delta 8.7 will not tell policy actors the answers. Instead, we are providing a platform that fosters scientific discourse, strengthening the evidence base through dialogue and testing over time, and helping policy actors make sense of the science. Delta 8.7 is a platform for policy actors, researchers, survivors and practitioners to engage each other and discuss evidence and ideas, building a robust evidence base over time. We will help move the science forward, and help all stakeholders figure out how to translate the science into effective policy. Our success depends on the active engagement of thought leaders in the field, from the International Labour Organization to the Global Fund to End Modern Slavery, from the Understanding Children’s Work research programme to the Walk Free Foundation, and from the Freedom Fund to the thought leaders at Brazil’s SmartLab. More than fifteen columnists will keep readers up to date with the latest insights. And the platform will also help readers find their way to anti-trafficking organizations working on the frontlines around the world. Success will also depend on the active engagement of policy actors. The site’s Call to Action page highlights the commitment of more than 62 countries worldwide to accelerating action to achieve Target 8.7. Over time, we hope that Delta 8.7 will strengthen the ties between thought leaders and policy actors, including through real-life events to bring this science-driven policy community together in person. You can watch videos from the first such event, which brought more than 100 people together at UN headquarters in July 2018, here. …we would need to reduce the number of victims by around 8,994 people per day, in order to be close to zero by 31 December 2030. People learn in different ways – and Delta 8.7 therefore offers many ways to learn. A good place to start is our Guided Tour. For those looking for quick snapshots of what is known about how Target 8.7 interacts with different areas of policy and practice, the Thematic Overviews offer a quick way in. These overviews are prepared through consultations with our multistakeholder Reference Group, and other experts, and in accordance with our editorial and site policies. Our thematic coverage will expand over time. Our basic Glossary may also prove useful. The Forum aims to become the world’s leading venue for discussion of the latest data and evidence about forced labour, modern slavery, human trafficking and child labour, and what it means for policy to achieve Target 8.7. Over time, we will also point readers to a growing array of resources on How to Measure the Change generated by our partners. Many people learn visually. Data visualization is central to our approach, as our recent analysis of Official Development Assistance on Target 8.7 demonstrates. Starting in December 2018, Delta 8.7 will also provide detailed data dashboards collating diverse statistical and qualitative information relevant to Target 8.7, starting with the Call to Action countries. Finally, Delta 8.7 also offers partners the opportunity to advertise their own Learning Opportunities, which already cover everything from good practice in data and measurement to the role of new technology in achieving Target 8.7. Readers that are particularly interested in certain topics can use the tags on the right-hand column to find related content, or the search toolbar at the top right of the page. You can also sign up for our newsletter, and follow us on Twitter and Facebook. But to get the most out of Delta 8.7, you will need to engage with us actively. You are always welcome to contact us to provide feedback and tell us what you want from the site. More than that, Delta 8.7 offers you a platform to engage the emerging policy community focused on using evidence to achieve Target 8.7. We welcome your contributions. Ultimately, whether we achieve Target 8.7 depends on how we come together to learn and act. We hope that Delta 8.7 will make this easier. But ultimately, the outcome it is up to you, readers. James Cockayne is the Delta 8.7 Project Director. This article has been prepared by James Cockayne as a contribution to Delta 8.7. As provided for in the Terms and Conditions of Use of Delta 8.7, the opinions expressed in this article are those of the author and do not necessarily reflect those of UNU or its partners.